It’s official, or at least Instagram official. In a match made in young Hollywood heaven, it looks like Bella Thorne and Tyler Posey are super close. Just a week after they were spotted in West Hollywood hanging out and kissing (! ), they seem to be taking whatever they have public. While we don’t want to read too much into this post, a la Ariana Grande, we think they are so cute together. 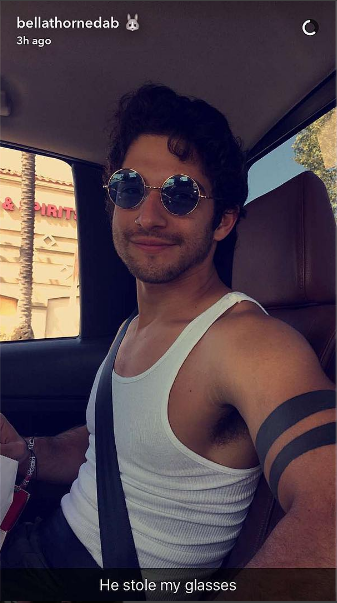 Thorne and Posey were first linked together in June 2015 after hosting the MTV Fandom Awards. Despite previous rumors, the duo have been longtime friends, documenting their friendship on Snapchat and Instagram. Just last month, Thorne split from boyfriend Gregg Sulkin, after over a year together. The Famous in Love star also recently came out as bisexual in a response to a fan on Twitter. The Teen Wolf star hasn’t been linked with anyone since calling off his engagement to make-up artist Seana Gorlick in October 2014. According to a source to E! News, the relationship isn’t serious and the couple is just seeing where things go. Ahh young love! We’re hoping for the best and more cute Instas!